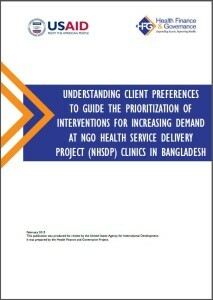 Resource Description: The study entitled “Understanding Client Preferences to Guide the Prioritization of Interventions for Increasing Demand at NGO Health Service Delivery Project (NHSDP) Clinics in Bangladesh” describes the results of a discrete choice experiment (DCE) undertaken to quantitatively assess the factors influencing the demand for maternal and child health care in the catchment population of USAID’s NGO Health Service Delivery Project (NHSDP)-supported network of Smiling Sun health facilities. The purpose of the study was to support the prioritization of interventions that would have the highest impact in increasing the demand for services. The study identified two main attributes that respondents find highly desirable relative to the others studied – brand name drug availability and polite provider attitude. These and further study findings can help the NHSDP network modify their service delivery models and financing mechanisms to increase demand for services.